Many people have crowded or crooked teeth. 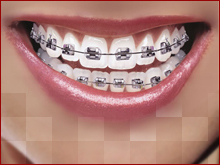 Orthodontic treatment will straighten the teeth or move them into a better position. This can not only improve their appearance but also the way the teeth bite together, while also making them easier to clean. In some patients the upper front teeth can stick out and look unsightly. These 'prominent' teeth are more likely to be damaged, but orthodontic treatment can move them back into line. In others, the way the upper and lower jaws meet can cause teeth to look unsightly and lead to an incorrect bite. Orthodontic treatment may be able to correct both. When the teeth don't meet correctly, this can put strain on the muscles of the jaw, causing jaw and joint problems and in some cases headaches. Orthodontic treatment can help you to bite more evenly and reduce the strain.